A new survey casts some shade on enterprise mobile app development efforts. After screening some 4,000 office workers, a mobile dev shop reported that only 12 percent use enterprise mobile apps in the workplace. And while that minority of users report increased productivity from using enterprise mobile apps, they aren't that impressed by the resulting user experience (UX). ArcTouch Mobile & Connected Experiences, a custom development shop based in San Francisco, collaborated with research firm Precision Sample on an online survey that screened the 4,000 enterprise employees and drilled down into usage patterns of 487 Americans who reported using enterprise apps at least once a week. The firm published the results yesterday in the "Functional But Unfriendly: A UX Study of Enterprise Mobile Apps" report (free PDF download upon providing registration information). "There is a significant missed opportunity when it comes to enterprise mobile apps in today's workplace,” said company exec Adam Fingerman in a news release publicizing the report yesterday. "First, there is a large unmet appetite for apps among the workforce, and second, a slew of apps that are in use are simply missing the mark. With great enterprise mobile apps, employers have the opportunity to improve their employees' productivity and overall work experience. Yet many enterprise mobile apps today are simply not living up to user expectations." * "Stated Importance" is based on percent of respondents who indicated that the aspect is "very important" for enterprise mobile apps. Performance based on percent of respondents who gave their most-used enterprise mobile app a grade of "A" for that aspect. 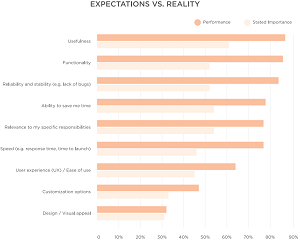 Those user expectations are especially unmet in the UX aspects of design and ease of use. The firm said "70 percent of respondents wouldn't describe their most-used app as intuitive, and only 13 percent would describe it as elegant." 85 percent of enterprise mobile app users think that their most-used app saves them time. 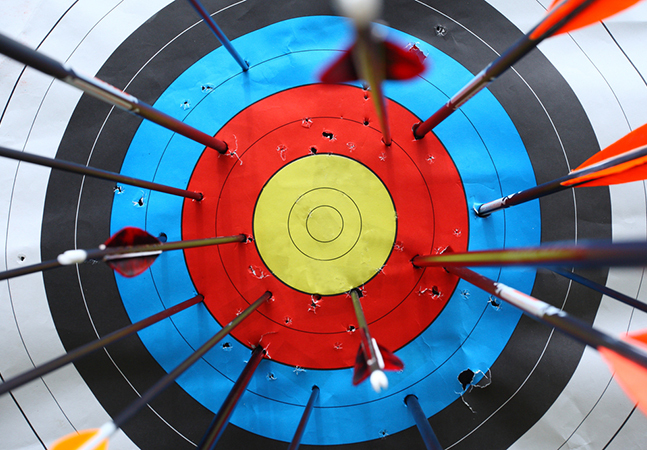 83 percent think that their most-used app makes them more productive. 61 percent give their most-used enterprise mobile app an "A" for usefulness. 85 percent of users are pleased with their app overall, but that favorability is tempered: Users are more likely to be somewhat pleased (45 percent) than strongly pleased (40 percent). 34 percent do not look forward to using their enterprise mobile apps. The aspects that most impact whether users look forward to using the app -- design and UX/ease of use are the worst performing aspects of current enterprise mobile apps. "Unfortunately, enterprise mobile apps still have significant ground to make up when it comes to user experience," the report concluded. 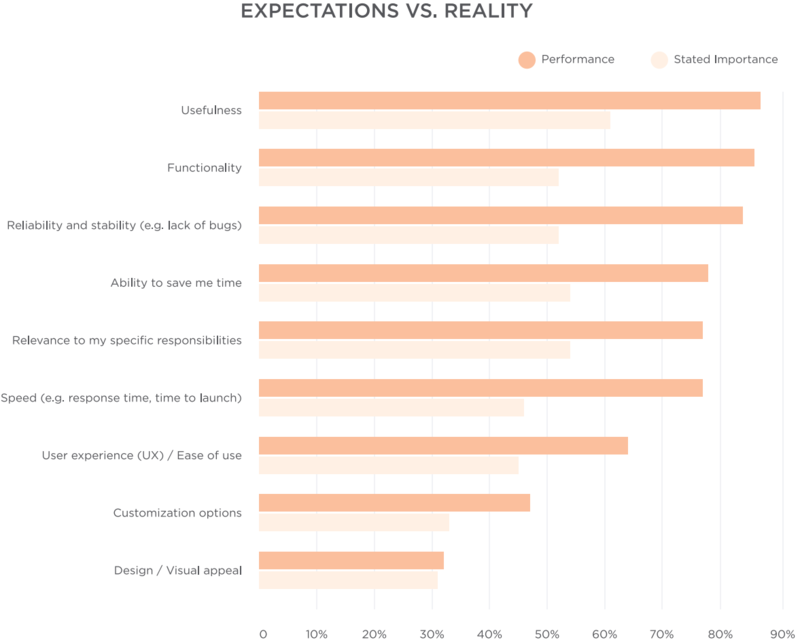 "A significant gap between expectations and reality persists for key aspects of app performance today. The factors that most commonly drive desire to use apps are the ones that rank the lowest when it comes to performance. "Meanwhile, only one-in-four enterprise app users strongly looks forward to using their most-used enterprise mobile app, and one-in-three don't look forward to using it at all. As millennial and younger employees continue to increase in the workforce, enterprise mobile apps will have to evolve to match the experience they expect."